We as Jeevan Samvardhan Foundation (JSF) working with orphan, tribal, homeless and needy kids on various socio-economic issues. In metro city like Mumbai, we used to see the helpless children working for daily breads and needs at traffic signals, under the bridges, selling something in railway. But future of many awaits for dark and horrible life in crime world. Rather the situations are well orchestrated for his or path in crimes. 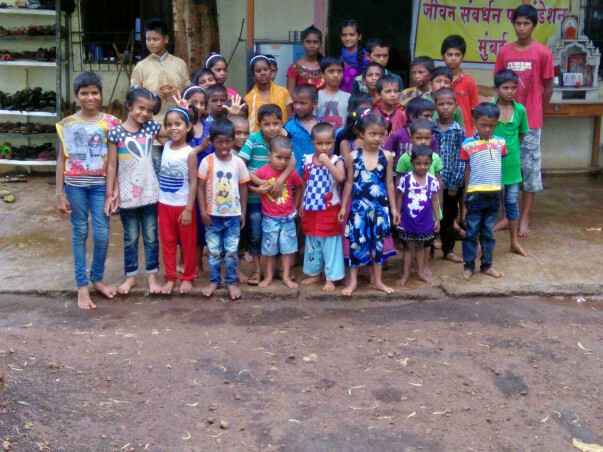 Kids living in our Gurukul at Mhaskal village, Titwala are such kids...everyone is having his own life story, scary but true. Some are having parents but they can't feed or look after them. Some are having single parent, some are living with grand parents, or relative. Or some are not having anyone to look after. Majorly the parents are from weaker financial group... working on daily wages. If neglected this kids will not have futures and society will have increasing social evils, criminals. Or they will be indulged in malpractice, like drug racket or flesh trade, or fall prey to child trafficking ! One kind hearted offered his constructed structure for Gurukul. So the issue of shelter temporarily resolved and kids are enrolled in schools. Where they are getting education. Food and other necessities are also a need been taken care by charity and donations. Currently there are 45 kids living and studying in this project. To take care of this project there are four full timer activists living with the kids 24x7 !!! We need help on below. ■Expenses per child per annum is Rs. 30,000 approx. Lets get together & give our society an example that goodness comes in any form. 🙏🏽Requesting Everyone to Support this Cause where we all can provide a better living for some street kids who are being sheltered🏘at Titwala JEEVAN SAWARDHAN FOUNDATION. We together can contribute and make this happen . *Giving is the Ultimate Happiness*... give it a try Smiles & Blessings will flow Abundantly.